Hi! 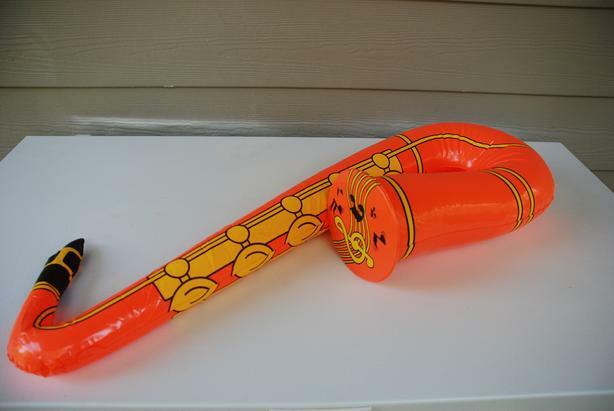 I have 19 inflatable saxophones for sale. They are all brand new in unopened packages (except for the one I opened to photograph for this ad). They are made of durable vinyl with realistic markings of a real tenor sax and a comparable size to the real thing as well measuring 31"L x 10"W x 5.5"H. The 19 are made up of three bright colours: 4 orange with yellow keys, 6 pink with blue keys, and 9 purple with black keys. There is a flap with a hole in each sax so it can be hung up from the ceiling as a decoration if you wish. These are great musical props for a musically-themed party/hostess swag bag or a karaoke night or an accessory for a musician costume at Halloween. They are small and lightweight to store but transform into a large party decoration ... and they can be used over and over. I am asking $50 for all 19 saxes ... that's $2.63 each with no taxes or border fees (like I paid when I bought them from the States). I am located in Vancouver, BC but shipping is no problem. I will be happy to mail these saxes to you using CanadaPost and Interac bank transfer. So, if you are interested in purchasing, e-mail me and we'll figure out the logistics and/or I can answer any questions you may have. Thanks!